How the zombies have fallen. Once they were a terrifying, cannibalistic reflection of our basest impulses, but decades of B-movie hackery have reduced them to an iconic geek totem, like ninjas or pirates or nuns. The Return of the Living Dead plastered them with a goofy catch-phrase ("BRAAAAAAAIINNSS"), and now, except for a couple of attempts to resurrect them as drooling sprinters, they're pretty much a joke. Just look at them here. They've literally been turned into plant food, getting pelted to bits by peas and cabbage. 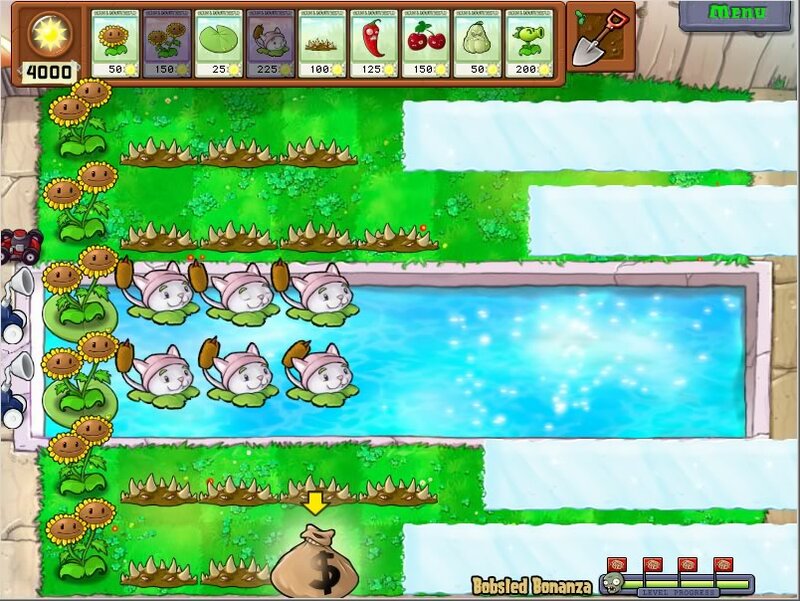 Plants vs. Zombies is the strangest, most original game from PopCap yet. If you missed the teaser, starring an adorable sunflower voiced by Laura Shigihara and an entire rave party's worth of zombies, you might want to watch it now. It's one of the greatest promotional videos for a game in history. PopCap has reason to be confident. While this is basically a melding of time-management gameplay with tower defense, it's so packed with colorful invention, it feels like a completely new concept. You play the part of a home-owner in the midst of a typical zombie apocalypse, but exaggerated to a cartoon fever pitch. Beyond the suit-wearing regular zombies, you'll face zombies in football gear, zombies on pogo sticks, pole-vaulting zombies, and many more. The undead starving hordes are on the march, but your back yard is standing in the way, covered with fresh, fertilized topsoil. By planting various types of seeds, you must raise a crop of warrior vegetation that can defend your brains from the imminent devouring. In gameplay terms, you have five lanes to defend (six on some levels) against the zombies, who enter on the right side of the screen and lurch slowly towards your home on the left. You select six plant types from your arsenal at the beginning of the level and then place them strategically on the lawn where they can fire on the approaching undead, who will fight back by munching on anything in arm's reach. You will gradually unlock a wide variety of plants (nearly 50!). Most of them act as stationary guns, periodically shooting peas or watermelons or what-have-you. Some protect the others, like the lovable Wall-Nut, some explode, like the Cherry Bomb, and some serve more specific purposes. Certain plants are effective against certain zombies, and vice versa. Each plant costs a certain amount of sunlight to create. Actual globs of sun will fall periodically to the earth, and you must click on them to add to your supply. The sunflower will be your staple crop, providing another source of sunlight globs that can be used to power the rest of your vegetable army. Watching for and collecting sun occupies your time between planting, much like the resource-gathering of Popcap's own Insaniquarium. There are 50 levels in the main Adventure Mode, spread across five different settings and about seven hours of gameplay. Each area requires a slightly different approach. At night-time, for example, you'll need to deploy bargain-price mushrooms to offset the lack of sunlight. In the pool, you'll need to support your plants on lily pads. After completing the main storyline, there's still plenty left to do. The Survival Modes are like extended versions of a regular level, while the Puzzle Modes mix things up by hiding a variety of enemies in breakable vases, or by casting you as the zombies against a pre-figured squadron of plants. The real treat, however, is the Mini-Games, which riff on the main theme in just about every way imaginable. Look for bizarre hybrid call-backs to PopCap's previous games, like Bejeweled (here titled Beghouled) and Hammer Heads. Having trouble with Zombies eating your brains? Are you always running out of lawnmowers? Don't miss our Plants vs. Zombies Strategy Guide! 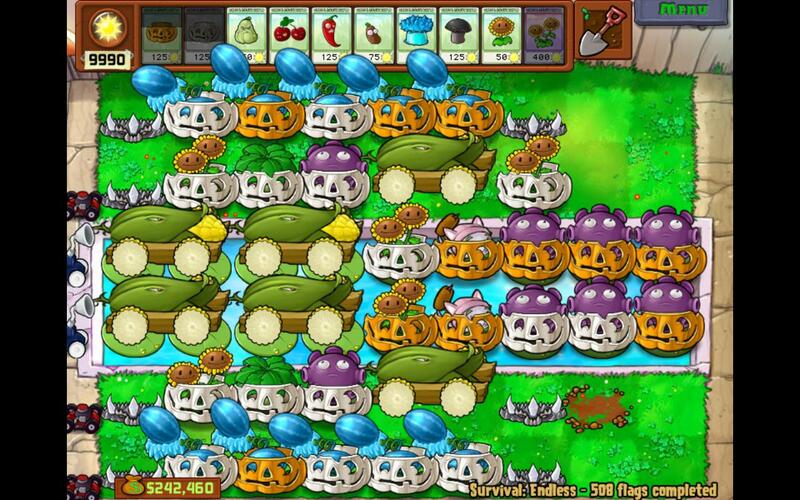 Analysis: The surprise of Plants vs. Zombies is how much sense the match-up makes. Zombies are slow, but plants are immobile. Zombies can be decapitated, but plants can be eaten. It's like they were just waiting to co-star in a video game. If you still shiver from dopamine withdrawal when you think back on the "Ode to Joy" from Peggle, you can get ready to kiss your social life goodbye for a few days. Plants Vs. Zombies rewards you constantly. The entire adventure mode is a parade of gifts—new plant seeds, new gameplay modes, threatening notes from your more literate zombie opponents. Each present comes right at the end of a level, so the desire to instantly hit the Continue button and play with your new toy is irresistible. The zombies even drop coins, which can buy upgraded plants and other goodies out of the trunk of your insane neighbor's car. 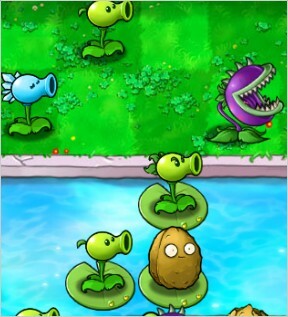 Because the plants are so specific in their look and animation, each one is not only a unique weapon for repelling the zombie horde, but a whole character, complete with a biography. 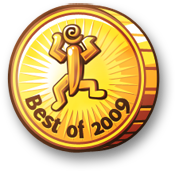 Both the plants and the zombies get well-written, often hilarious entries in the Suburban Almanac, which is a source of both entertainment and valuable information. The shine doesn't come off the game until you've completed ALL the mini-games, and ALL the puzzle levels, and ALL the survival modes, earning of course a golden trophy for each one. Even then, there are a handful of high score modes, and the surprisingly addictive Zen Garden, a mellow side pursuit which may awaken a gardening version of the Pokemon catch-em-all ethos in you. If I could cross-breed plants to produce new mutated soldiers for battle, you would not be reading this review right now, because I wouldn't have been able to physically tear myself away from the game to write it. 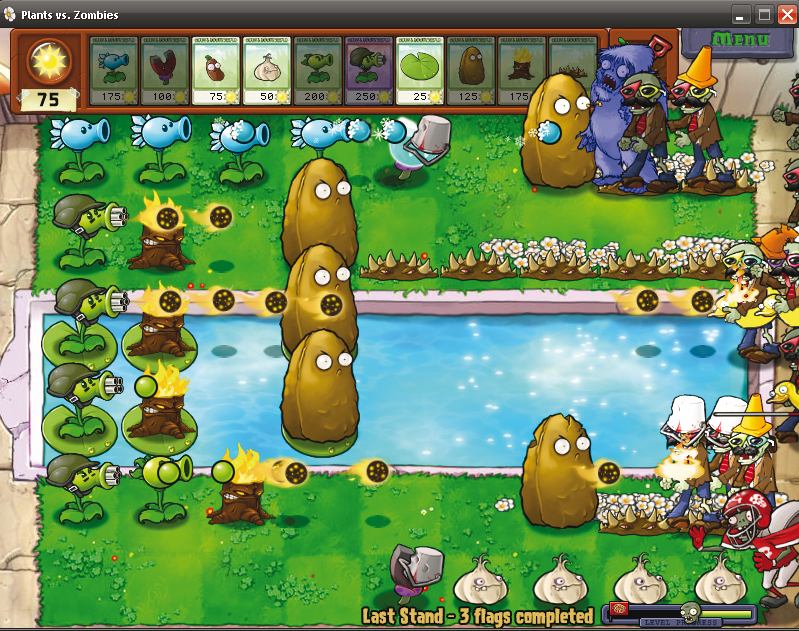 The only real problem is that Plants vs. Zombies never does get very difficult. This is partly due to the silky-smooth learning curve. You barely notice the increasing challenge, since your skills and resources grow perfectly to match it. The other reason is that there isn't really a very wide range of strategy. Many of the later plants are just slight alterations on earlier ones, gauged to the needs of the current enemies. Despite a massive effort to inject variety by mixing mini-games right into the main adventure, many levels feel too similar to each other. This is especially true at the start of a level, when you're setting up the first few sunflowers the same way you did the last twenty times. Get Plants vs. Zombies (PC/Mac) for only $6.99! Get Plants vs. Zombies (iOS) for only $2.99! Get Plants vs. Zombies HD (iPad) for only $9.99! But these minor hiccups pale in the face of the endless barrage of cheerful absurdity. The fact that a zombie's first choice of armor is an orange road cone hat. The way a potato mine explodes with a deep-fried SPUD-OW! The angry eyebrows on a powered-up pea-shooter. Of course a zombie comes in riding an ice-making zamboni; it's a ZOMBoni! Of course a zombie bobsled team comes in after that; there's ice for them to slide on! Without a doubt, this is one of the defining casual games of this generation. If you're a fan of Insaniquarium or Farm Frenzy, this is a no-BRAAAAIIINer (sorry), but there is enough quirky appeal in this title to seduce practically anyone. PopCap proves that following a goofy idea to ridiculous extremes can be a winning proposition. There won't be any Plants vs. Zombies clones, because you could never copy its force of personality. Highly recommended. This game definitely falls under the category of "Now I've seen everything." This demo better run out soon or I'll never get anything done today.. I love how the lawnmowers get 'em if the zombies get too close! There's a zombie on your lawn. Plants vs Zombies Strategy Guide! I'm not going to go through and list all the plants and zombies because they are listed under the Almanac you will get within a few levels of starting the game. While you are trying to get your sunflowers up, try to only build plants that you will need immediately. 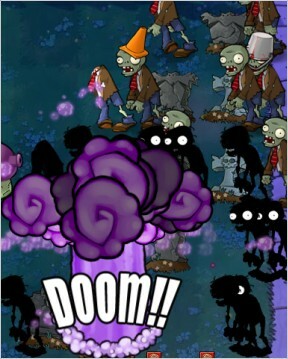 Such as a peashooter only in a lane where a zombie is approching. Once you've got your sunflowers up, start focusing on your defences. You will need to use different strategies depending on what level you are on. Try to keep at least one bomb type plant in your inventory on each level just in case things get bad. If there is a lull in zombies use the break to dig up and replace badly damaged wall-nuts or tall-nuts. It may be worth it in later levels to bring coffee beans and magnet-shrooms with you in daytime battles. to help deal with metal weilding zombies. If a snow pea shoots through a torchwood then it will cancel out the freezing effect. Adventure mode isn't terribly difficult and shouldn't give you too much trouble so I've just listed off a few tips for each of the five level types. These levels are fairly straightforward. Just build a few peashooters in each lane and you should be okay for most of these levels. Night time has arrived! No more free sunshine for you! Dont underestimate the power of free things. Although the puff-shrooms are pretty weak, they are essential to your defenses at night time, especially when the amount of sun you get is lower. Make sure the first plant you buy is one of the two that will give you sun, otherwise you wont be able to afford better plants as the level progresses. Ah now its getting interesting. Zombies will usually ignore the two pool lanes in the beginning, so you should too. Make sure to build at least a peashooter and a repeater in the pool lanes by the first huge wave of zombies, as there will be extra zombies that pop out of the water part way down the lane already on top of the ones that come from the back. As long as you remember to have some defences in the pool lanes by the first wave you should be alright. Remember you can place wall-nuts and tall-nuts on the lily pads. You should put spikeweeds at the right of your lawn in case zambonies show up. Starting to get tricky now. Pool, night, and now fog! Keep your head on your shoulders (har har), and you will do fine. Although you can't see in the fog you can still build in it. Build up a solid defense by combining what you did in the night stage with the pool stage. If you really need too you can build a lantern to help you see, but its not too much of a big deal. Just build up a solid defense and you should be alright. Its going to get a little tricky now. Peashooters and repeaters don't work well on this level, unless you build them at the top of the slope. You can get away with building them on the first column after the slope on the roof starts but after that they will be useless. Basically for this part you will need to replace peashooters and repeaters with Cabbage-Pults and Kernel-Pults. Other than that theres not too much to this one, other than keeping an eye on what zombies you will have to fight. It might be worth your effort to build a magnet-shroom and use a coffee bean on it in later levels. In this one the zombies are also plants! But they still want your brain. Guard your sunflowers because you will need all the sun you can get. Just like the wall-nut bowling you had to do in adventure mode. Save a bomb or two for emergencies. Try and keep the slot machine going as often as you can to earn extra plants and sun. Shouldn't be hard to get this with a little luck. Just like bejeweled! You fought zombies in bejeweled right? Its pretty basic, other than the fact that the zombies are invisible. So build evenly in the lanes since you can't tell where they are coming from! Might be a bit tricky to get "Star"ted (haha! ), but once you get some basic defenses up you should fill in the star as soon as possible. This one is a basic clone of insaniquarium. Just save up and buy 5 or 6 zombies then let the sun roll in. Don't forget to feed them! All of the zombies are tiny, but they still have big appetites! Use the basic pool defense here and you'll do just fine. This ones a bit tricky. Keep an eye on where the portals are but still build evenly as the portals will move around the map. Save a bomb or two in case things get a little tight. This one can be a bit tricky. For the most part you will start with the same few plants each time. Potato mines should go one column from the right, and your tall-nuts right behind them. After that leave a space then put your magnet-shrooms down. If/when you get chompers put them right behind your tall nuts. Try to have at least one clear column somewhere for placing bombs. Save the bombs you get for ladder zombies, Gargantuars. As long as you don't let the ladder zombies bypass your tall nuts, and you put lots of pumpkins down you shouldn't do too badly here. Might take a few trys to get it just right though, since you don't always get the same plants each round. Build spikeweeds to pop the tires of the zombonies. If they can't make ice the bobsled zombies can't show up! You can also use jalapeños to melt the ice. Use your basic pool level strategy and you'll do just fine here, just make sure to keep collecting the sun, even though it might seem hard since it shows up so fast. Once in a while a zombie will drop some sun, use it to buy Grave Busters and eat the graves closest to your brains. you start with $5000 to build your defense and you will get $250 between each round to top up. Build a nice solid pool style defense and you should be okay. Remember to save some money for buying new tall-nuts in case things go sour. Just like zombotany only harder. Just like Wall-nut bowling only harder. Just like the final level of the game so you should be okay here. Just remember to always keep at least one jalapeño and one ice-shroom on you at all times for when he throws fireballs or iceballs at you. There are only really two puzzles here, one is vases and the other you play as the zombies. After that start at the back and work on one lane at a time. Don't put too many plants in one lane, you will need to make sure you have at least one offensive plant in each lane or its impossible to win. In the later levels keep some squash for Gargantuars. In this one you get to play the zombies and try to eat the brains. There is no time limit so sit back and think a bit before you start throwing zombies at the plants. Try to find the spot where you can send one or two cheap zombies and still manage to get a sunflower, or two. Once you get some sun use stronger zombies in combination with the weaker ones to get to the harder brains. In survival you will get a chance to change up the plants you picked at the start between each level so start with the basics on each one, and go from there. Don't get ahead of yourself. If you start with all the expensive plants you won't be able to afford a good defense and will leave your brains venurable. Use the same basic defense skills you developed for each of the adventure levels, but after a few waves upgrade your plants to be able to deal with the later levels. There isn't much new here it's just harder. Type the following codes during gameplay to enable the 'cheats', type them again to disable. future - zombies sport cool, futuristic shades. mustache - zombies grow a 'stache. trickedout - for tricked out lawnmowers. sukhbir - activates zombie "THEIR BRAIIINS" call. dance - Makes the zombies dance! enabled at 500 feet. Read our Plants vs. Zombies Guide - for even more information including each Plant and Zombie you will meet in the game. When I download the demo for Mac I get a .exe-file, for PC, does anybody else have the same problem? So we're supposed to change .exe into .dmg? Because that doesn't work for me. We don't want zombies on the lawn! Oh, I see, the problem is I was on the French version of the site, which somehow doesn't require your email for downloading. All fixed now. Seeing a zombie float across the JIG homepage is quite a surprise. Is it just me or is there a flying zombie loose in JIG? I'm experiencing the same problem as the Mac user above. But the advice in the comment isn't working for me. The only download link visible is a direct link to a .exe, at no point am I asked for an e-mail address or anything like that, just a direct link to a .exe. I know that this doesn't have anything to do with the game, but who programmed the flying zombie onto the JIG homepage? I'm using Mac OS X 10.5.6 and the game keeps suddenly quitting on me for no apparent reason giving me an error message. Is anyone else having this problem with the game? It doesn't matter too much, because I can reload it just fine, and I usually only lose a few minutes of playtime due to the way the game saves. However, I am strongly considering buying this. I just gotta see if I can get better. I have the same problem as Dooreato and Jimmy. The game had a hole and out popped a zombie on a balloon! Here's some tape to fix that mess. Well, the trailer song is fun, at least. Here's seeing if the game's as fun. Sorry Jay, but you're wrong. No matter what I do the download link only gives me a .exe file, including following your link above. I can't click on the 'also for mac' button because there isn't one, only an 'also for PC' one, which means I'm definitely on the right page. It says '(Mac, 28.1 MB, .dmg file)' underneath the download link, but that's not what I get when I click it. What a stupid mistake for them to have made. I'm desperate to have a go at this game and now I can't because someone who runs the site messed up. Pretty badly. I, too, can't seem to download a .dmg file. 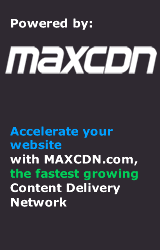 I've tried both the Windows links and Mac links, tried the orange PC/Mac badges on the site, tried refreshing (a lot), and even tried a different browser. Whatever I do I always get a .exe file when the download starts. Interestingly I've seen a 1.1, 1.2 and even once a 1.3 version of the .exe files, so I don't know what that's about. When load balancing goes bad, perhaps? Anyway, if you say Popcap are onto it, then maybe I'll check back tomorrow. For those on Macs who are getting a .exe file from PopCap's download page, try this link instead. And Jay spoke, and lo, the clouds parted and there was revealed a DMG. Excellent, it works, time to go lose an hour of my life. Emöjk has saved the day though, thankyou thankyou thankyou! I, too, spent the last five minutes or so trying to get the Mac demo to download, trying every possible combination of links and buttons suggested above. All I ever get is the .exe (1_1 or 1_2, depending on which language I try), which is quite frustrating... hope they fix it soon. I believe PopCap has several servers set up for load balancing, which could mean that you are randomly hitting the one server that still has this problem. Try closing your browser, relaunch and try the link again. You might find that the download link will finally give you a .dmg file as it should. Until they can fix it, you can download the Mac version here. The Mac download link in my comment above is still only a link for the demo, it's just that we won't get credit for it if you wind up purchasing it from that version. So, it's still best to use the links above in the review if you're able to, please. It was worth a couple hours of gameplay just to get to the Thriller zombies. OMG. Iskandar - have you purchased the Twin Sunflower upgrade? That one comes in handy during the mini-games and survival modes. As for the Zomboni and bobsled teams, Spikeweed is cheap and efficient, but you have to keep laying it down with each tire that's popped since it's only single use in those circumstances. Get the Spikerock upgrade to help, but I didn't use that myself for besting Bobsled Bonanza. Also, arm yourself with lots of explosives(!) Jalapeno is essential. Ok, another update here. I just beat that mini-game again and I agree that it's a hard one to defend in the beginning. I had to give up several of the lawnmowers early in the game, but the strategy of placing lots of Spikeweed is key since most of the zombies in this mini-game are weak. Walking over a couple of Spikeweeds is enough to kill them. jamalko - The quickest way I've found to make money is Endless Survival Mode. There are way more zombies to kill, so they drop more coins. Plant one or two golden magnet-shrooms to make sure you get them all. You also want to buy marigold sprouts for your Zen Garden. They give you diamonds when they reach maturity, and then you can sell them for their full purchase price. You can buy three marigolds per day, and that starts to add up after a while. if you put the spideweeds at the front of your lawn they will pop the zomboni tires before there is enough ice for a zombie bobsled team to even show up! I think the idea *stemmed* from the thought, "What would happen if plant pokemon versed zombies?"... 'Oddish! I choose you'. lol. Looks cool. I'm so getting it. Haha! Beat it with a bit of help of Jay's pic ;). Gracias! I've got marigolds for my Zen garden, but how do I get plants for the aquarium / night-time garden? wglmb - When playing the mini-games, puzzles, and survival modes, you are randomly awarded a present, a red gift-wrapped box with a white bow on it. These contain new plants for your zen gardens. Keep collecting them as they will contain a random plant, and eventually you will be rewarded with night-time and aqua plants. Also, check the shop. Your crazy neighbor will offer 3 different plants (also at random) for $3000 each. Keep buying those to add to your garden. You can sell the duplicates back to the shop. Jay, have you ever gotten a plant other than a marigold from Dave's shop? I only get marigolds. They come in a bunch of different colors, though, and if you have my particular strain of obsessiveness, you only sell marigolds if they're an exact copy of another one you already own. Actually, no. All that I've seen from the shop are a rainbow of marigolds. You are more likley to get plants for night time by playing night based levels, same goes for aqua plants. Crazy dave only sells marigolds. This really is one of the best games to come along in a long time! I am enjoying it so much, I can't even believe it!! The new plants and new zombies keep me guessing and laughing. Fabulous game, really! Great game, The amount of money you make is pretty balanced at the start but it could be raised a bit near the end IMO.. Also, a good way to gain money is the slot level, where you play with a slotsmachine, I recieved 3 diamonds once there (wich gave 3000 money I assume). Coins are only 10 and 50 or something, it doesnt add up at all.. Most upgrades are around 30K. How much do the zen flowers give when max? Q77: I found a good way to make money was buy the three marigolds from Crazy Dave's shop and grow them until they are big (they will give you a diamond), and then sell them back to him. Also the plants you find in the game give more money than the marigolds you can buy. Zombie survival endless is also a great way to make some cash. Yeah I guess so.. So the flowers dont give more than that one diamond? It doesnt evolve more? Sounds like a ****** deal to me, they cost 2500, plus the food they take, and the music wich costs what, 15.000? Crazy Dave gives 3000 for them, so thats a profit of 500,minus all the costs. Granted you gain 1 diamond and some spare change from them, but still... I did recieve a pea shooter wich gave 2 diamonds, but bleh.. Takes forever to get 80.000 for 10 slots. You can also grow a lot of plants, leave the zen garden open for an hour and give stinky some chocolate. He'll "run" around and collect coins for you, as long as they flowers are happy they will make coins every minute or so. I've beaten all the mini games except for survival now, and am running through the adventure portion again. Beating Bobsled Bonanza was a pain. I did finally realize that using spikeweeds to pop tires was a bad idea in the beginning. a squash or even a potato mine (Spudow! just kills me every time) will work just as well and is much cheaper. Then, when your sunflowers are up and running, and you've cleared some ice via the hot pepper, THEN use spikeweeds to keep the zombonis at bay from the lanes you've cleared. I'm working on buying Crazy Dave out of stuff. I'm missing the aquatic garden and the 10-slot upgrade, plus a handful of upgraded seeds. I'm waiting on the seed upgrades before trying survival. Really good strategy game. As of the moment, I've gotten the golden trophy, night garden and all cards. Now I just need to know how long I can last with the survival endless game. As of the moment, I've only lasted 22 flags.T_T They shouldn't have made red eyed gargantuans. They almost never die. 2. create 1 gold magnet anywhere safe. 3. plant as many marigold as you can. It's a great game for sure. However I gotta disagree that it's their most original game. Surely Bejeweled that spawned a new genre of match three games is still their best and most original game. PvZ feels like a TD game with a twist. The problem is, though it plays like a TD, it's lacking in much of the strategy and variation that makes the genre challenging and fun. In a TD you choose your tower type and placement very carefully for maximum coverage and effectiveness. In PvZ your decisions feel much less strategic and often repeated again and again from level to level. It feels like there is less room for experimentation of strategies. The overall effect is that the game is fun but leaves me a bit unsatisfied like I ate too much junk food. All in all, a very polished title none the less - as we would expect from top tier developers Popcap. I don't see Bejeweled as being a particularly original game. It was extremely influential, of course, and it may have been the first really successful game of its type on PC, but Sega's Columns and Nintendo's Puzzle League series had already established Match-3 gameplay years earlier. It was already a popular genre on consoles. PopCap just took the idea, polished it up, and made it their own. And although PvZ does contain artifacts from the tower defense genre, it just doesn't feel much like a tower defense game to me. It bears much more resemblance to other time-management games -- Farm Frenzy, Insaniquarium (which I'm sure inspired Farm Frenzy), even Diner Dash. You're managing several different lines of thought simultaneously. It's not so much about strategy as it is about multi-tasking. The strict time limit imposed by the approaching zombies feels much closer to the dwindling happiness of a Cake Mania customer than it does to the creeps of Flash Element TD. But the grid layout, and the variety of characters, and the unique way that all the different influences have been hybrid-ized; those things make it feel like a new type of game to me. It owes something to tower defense and time-management, for sure, but much less than Bejeweled owed to Panel de Pon. Hi! My tree of wisdom is already at 320 feet and O still can't use the 'pinata' easter egg?! It always says my tree of wisdom isn't high enough. Rob: Oops! That was a mistake. We had updated our PvZ guide page, but forgot to update the corresponding section here in the walkthrough. Fixed! Check out our Plants vs. Zombies Guide. Go through adventure mode again as it changes after you've been through once, as plant choice becomes considerably more limited. Anyone have any tips for dealing with Gargantuas? JIGuest: Use cherry bombs or jalapeños, and squash to take them down quickly. 10 different colours of marigolds and counting.. I'm trying to collect 2 of each, one facing each way.. because clearly I have no life.. anyone know what happens if you run out of space in your zen garden?! They don't respawn fast enough. Level 25 of endless survival. Multiple waves of Gargantua. Stone spikes slow down the first wave long enough for me to wipe out one side with cob cannons and the other side with bombs, etc. Next wave beats down the last of the stone spikes before everything recharges. Wave after that walks through the Tallnuts and decimates the back ranks before anything is recharged. There's no recovering after that. JIGuest: I made it to Level 31. You don't need tall nuts if you use winter melons the slow down is enough that nothing makes it past 3 lanes of floor spike. The other recommendation is pumpkin shields covering EVERYTHING, a mid line of magnets to stop miners. and the well spaced umbrella covers you good. The biggest problem I had at level 30 was icers + gargantaurs. I could have made it further if it wasnt for those damn icers... I just couldn't keep up. A reccomendation at that level is to use imitator floor spikes. But you'll still run out of sun very fast. Here's the configuration I used for anyone interested. Pumpkins on everything but spikes. For 1st flag or two, all you want to do is build up sunflowers. For pool area, you want to start placing pumpkins on all lily pads starting where I marked the TP spot. As you have the sun, start replacing the Spikeweeds with Spikerocks, starting on the outside edges. Pumpkin everything (use the imitater to speed things up) but back 3 ranks in pool and spike weed/spike rocks. Start pool, then rear lawn. Try to replace the Spikerock closest to your plants 1st. For Gargantua waves, the cherry bomb, squash and Jalapeno are needed. Keep replacing pumpkins asap (I use the imitater for the pumpkins). Still surprised you didn't use cob cannons. I always found at least 4 of them super useful in near any situation. Especially against packs of gargantaurs. btw whats GS stand for? Also split pea why bother having them if you have star fruit? This game is definitely way too much fun. When I first saw the title and read the description, I thought "this is stupid... plants vs. zombies?? Ugh." Then I actually tried it... and it's a blast! The main game is sort of a humorous version of a defend-the-tower type game. The mini-games and puzzles are all different, though, and can keep you entertained for hours! I may try cob cannons again, but will have to place them in foward ranks, otherwise the zombies that the gargantaurs throw eat them too fast. here is a easy way to win last stand mini game Guarantee WIN! I have THE money maker set up in Last stand. Can you believe 30 (!!) Marigolds?? Can anyone do better than that? No. I just need to find a way to post it somewhere for all to see. Any suggestions? There's 2 Marigolds with pumpkins in water behind Wall Nuts. To all you P vs Z fans you are welcome. BTW This will make you 5-7k per game. Just replace your garlic between rounds and watch the money roll in!! You can walk away from the computer between rounds too!! Awsome huh? If you need help just ask, I like to give help. Put your cob cannons in the water at the back. I found the pool to be the easiest defended and nothing really ever got to the back rows. I made it to survival 41, dang cherrybomb set off a jack in the box zombie which killed my front line and then me. An excellent review of the game! Covers all the bases (good and bad). Now, what I want to know is if there's some forum we can discuss other tips about the game on. For example-- can anyone tell me where to find the Zombie Yeti? Or, tips and tricks on earning new plants for the Zen Garden in levels? Or, something dorky like, which zombie we'd add to the game. Hi, I have finished the game but I've noticed that in the almanac there's still one zombie that hasn't appeared, anyone else? Also, what is this about a pinata? Ok, I have clicked on the flowers at the main menu, some blow away, some don't do anything, and one just falls to the ground... What is supposed to happen and how does clicking on them help? The Yeti zombie. It appears randomly if you keep playing. That's all that happens with those flowers. It's just something to do that you don't expect from the game. #2- Id like to add that in my money-maker set up above that between rounds 1 and 2 you will need to place pumpkins on the second gloom shrooms from the left. (notice the plural? )This will ensure your dough. Torchwood and Gatling pea is a good combo, but costs alot. Don't just restart the level once a zombie has eaten half your plants. You'll have a better chance of winning if you actually try. I think CoCo means Zombotany 2. Don't forget to replace the garlic! I am having trouble saving my game. It keeps going back to level 2. Does anyone have a suggestion? I had so much fun in the demo. PopCap has done it again. I'm definitely buying this! it automatically gives you four diamond gems, 4,000 money coins!!! Sweet!!! How do you know if a plant is fully grown or not? mine just keep asking for bug spray or music and i cant tell if they are fully grown. Thx in advance. They plants in the zen garden are fully grown when they stop asking for fertilizer. I believe they have three growth spurts, then they are through growing and just want water, music, and bug spray. how do you get to see the yeti? Hi to all! i've been playing Plants vs. Zombies for weeks and I've been feeding the tree of wisdom lots of fertilizers, it reached 82 feet high since it was 60ft. Until now - its not giving me any tips! I'm spending a lot for nothing?! You'll get tips at 100, 500, and 1000 feet, though they actually just unlock the last three "cheats". Read the guide for details. Unfortunately, it only grows one foot per bag, so getting it to 1000 is going to be VERY expensive. Play the adventure level 4-10 a second time (on your second run through adventure). Afterwords, you'll see them randomly in all levels, as far as I know. Well Katt, you see, when you get the tree to 100 feet it will tell you some great info. Every time I "quit", the game resets to Level 3-1. Help! Anyone beaten Level 36 yet on Endless Survival? So far highest I've made is level 35 completed. For those who are wondering what layout..
Everything is protected by a pumpkin. I use SW instead of SR for the zombie-side column because it's cheaper than SR, especially once you've got that many, but more importantly because it's easier to take down Gargantuars when you have somewhere to place a bomb, and they take too long destroying the SR.
Having SR at the house side though - perfect solution for getting rid of miners. Magnets worked unreliably depending on how many miners etc, as did using spuds to blow them up and split peas to shoot ones that got through. Now I just ignore them because the SR is strong enough to destroy them before they can start eating anything. For taking down Gargantuars I use Cherry Bomb and Cherry Bomb imitator, and Jalapeno and Squash, and of course corn cannons. One annoyance is that the limit on sun seems to be 9990, which is really quite low when you can easily use half that if you have an expensive round. My fume-shrooms and gloom-shrooms started randomly flashing in unison on level 4-9. Any idea why? Or did I just not notice something really obvious? 564 flags on survival endless so far, still going. I have four open spaces left in my zen day garden, night one is full, and only 3 plants in the aquatic. I've played a lot of hours on PvsZ the last two days and I haven't received any new plants. Anyone know why that would be? What's the best/fast way of receiving plants? I've played Adventure twice, pretty much all of the puzzles, survival and frequent the mini games. My chocolate count is at 10. I do have doubles of some plants but I don't think I've gone this long with not getting much plants. Any help would be appreciated:) ~Thanks. There are only 3 aquatic plants and there should be 4 open slots in your day garden, you're done. 700 flags so far and still going with the same build as before, just lost one lawn mower to a balloon zombie that slipped through. The music video is hilarius. I lol'd at the second Pre-chorus with the tricycle, butter and dolphin! LOL! So addicted to this game!! This game is absolutely addicting. I love how each one of the plants has this silly quote. Also, how the zombies all seem so brainless haha, the googly eyes! The overall look is really great as well, very colorful. 1300 flags and still going with the same setup as before. This is just a totally awesome game, but Im having mega trouble with the roof level, with that big zombie that has the little zombie attached to him. Just when I think Ive nearly done it, zombies get through and down the chimney lol. Where am I going wrong?? Hi I'm new to PvZ but I have some news. I just got the Yeti in the mini game, Last stand (day light) he is so cool to watch. Good gaming to all. Hi PvZ gamers just got Yeti in last stand (day light)so it's not only night games. Good luck. Thankz Pop Cap love this game Plants vs Zombies. It has all I need in a game,fun,colour and different challenges. My tree is 712 feet high, would love to know how to make money quick to get it higher. Any advise would be good. Thankz again. Hi Guys. I've read all the comments and here are a few tips for people having trouble. 1. Lay down spike weed and rock, this really slows zombies down. 2. Use the freeze mushroom, it paralyses everything on the screen, so gargantuans and the zombinies cannot move and are very easy to pick off. 3. On roof levels use frozen watermelons, they slow everything down, so much so that once they are laid you just sit back and let them do all the work. nothing can get past them. When the gargantuans show up they get so beaten by the frozen watermelons they are very easy to blow away. Infact you should really use frozen watermelons on all levels. 4. Here's a crafty one. I uninstalled my graphics card drivers and the game has slowed down, a little like frozen watermelon does. This just gives you more time to react to approacing situations. 5. Cattails are a must, they fire into all lanes. 1600 flags in survival endless and still going with same setup as before. @Mo: Freeze shrooms don't affect zombonies. I wonder how you are doing this. I can't come further than 30-40 Flags. My endless rounds already starts after the first two level already with 4-6 level in a row with Gargantuars, from level 5 on the ones with red eyes (and of course the zombonies). HOW TO EARN MONEY QUICK!! Once you beat the game the first time through a mini-game called 'Seeing Stars' is unlocked. If you keep playing this level without filling in all of the Starfruit you can earn lots of mulah. Sunflowers, Marigolds, Magnet-Shroom, Gold Magnet (buy it from Crazy Dave for 3,000; it's worth it), Starfruit, Pumpkin, Tall-nut, Wall-nut and Cherry Bomb. 1. Fill in the back two rows with Sunflowers. Use the Potato Mine to kill the first couple zombies. 2. Now start filling in the middle vertical rows with Starfruit. Do not fill in the front Starfruit. 3. As soon as you feel comfortable place Marigolds in the two slots directly behind your Starfruit. 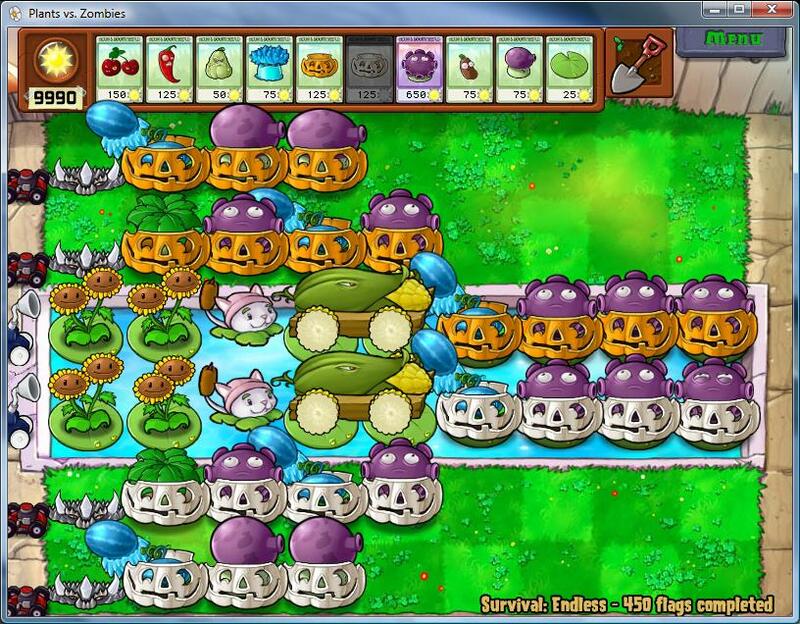 Place several defensive Wall-Nuts, Tall-Nuts and Pumpkins (over the front Starfruit) as you see fit. If you plan on playing for a while and collecting a LOT of cash I'd start building a MASSIVE wall of resistance right now. The zombie waves aren't bad yet but in 10 minutes they'll be a handful. 4. When I have enough extra sun I like to dig up a couple Sunflowers and replace them with Marigolds. Do not pull up the Sunflowers until you are ready to replace them with the marigolds because they take quite a while to refresh in the seed bank. 5. Seeing as you have about a thousand things you are clicking right now, pull up the Sunflower behind the row of five Starfruit and put in a Magnet-Shroom with the Gold Shroom embellishment. Now it will collect the coins and gems for you. Golden! 6. After about 15 minutes of game play you can't continue any longer. Quickly use your Cherry Bomb to clear a area and fill in the last one or two Starfruit that you need. I've found that you can make quite a bit of cash. Experiment with your timing of planting as well. Start planting the Marigolds within the first 40 seconds of the game when you get comfortable with the system. You just may find that money grows on trees.. -eh- flowers anyhow. Hope this helps you young flowering entrepreneurs. Anyone got any good tips on how to beat survival night (hard) onwards (i have all of the survival trophies on the first row and i finished survival day hard)and zombotany 2 (i beat ALL of the other minigames)? I have screen shot of Yeti in Last stand; flag 3, but do not know how to post it here. Can anyone give SIMPLE instructions please my commie skills are limited. I have saved it in Photoshop. Was that the right thing to do? The mighty has fallen! Died at 1678 flags after experiencing the perfect zombie storm, managed to hold on for a while but the end was inevitable. Great idea: MULTIPLAYER! Imagine it; one person would be zombies, picking from the list and then using a time-based system to release them (higher rank zombies would take longer), while the other player used plants. Or they could compete for less bites taken to their plants (wall/tall-nut value goes WAY down). Just an idea, I had to tell everyone. Here it is at last proof of Yeti in last stand (day light) Thank's Kayleigh for the advice and all the help getting this posted. PS There are 39 possible plants all up. Lol you know what is my secret? I've purchased the full version! i like this game a lot but it's terrible that once you exit you have to start playing all over again from the first level. isn't there a way to save a level or just play a mini game? Found a setup that runs forever unattended. Before you get too excited zen garden plants and coins stop dropping early on so you can't use this for anything other than a curiosity. Ha ha ha, did you know the secret zombie? What is the setup for survival hard night? It's the only one i dont have. what if plants can combine? like winter melon and gatling pea 4 melons at a time. I found a very good way to collect coins quickly. Once you have about 3 aquatic plants fully grown, give them chocolate and they will put out coins quickly! hit esc and go to another tab and let the plants put out their coins. Come back occasionally and reap the rewards! P.S. don't exit out the garden or you will need to give them chocolate again. wat difrens w/ red eyed grantuars and white eyed? The difference is in how much they can take from the flowers. The red-eyed need much more attacs before they go down. Oh man, I can't believe no one mentioned this yet. BEST WAY TO MAKE MONEY, exceeding that of the set up using the last stand etc. 3 New Marigolds are sold each day. Plants needs watering every 1h. Start by buying as many fertilizers as you can, and than marigolds as you can. Change your system time and date to a different day, and buy another 3, until your money runs low. Make sure you max out fertilizer first. Water the plants, then go to system time and change it to the +1 hr, and they will need watering again. Repeat and repeat and repeat until they each drop a diamond, than sell it. Using the new profits, buy more marigolds, by changing the system date and time and just repeat it, and you'll have 32 marigold in no time which corresponds to about 90k+. I started off with 7k, and had well over 100k within 20 minutes. Date, and time loopholes for the win! And when you change the system time and date, you do not even need to close and reopen the game. I love this game! I'm trying to complete the Zen Gardens, I have 46 out of 48 plants (excluding the pot). Where can I find the pumpkin and grave buster plants? Two things: First of all, I made the terrible mistake of watching the music video/credits again, and now can't get "there's a zombie in the yard" out of my head. Secondly, @MasterPlanter - changing your system date and time can be very, very bad for your computer. I did it while I was playing another game and sort of killed it for a while. It can mess up all sorts of stuff, so it generally isn't recommended. Just FYI, in case your computer starts going haywire and you don't know what's up with it, keep an eye on that. Rheezuh which plants do you have in your zen garden??? @Rheezuh, I've gotten the pumpkin and grave buster on some of the survival levels. 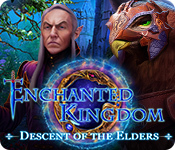 According to the Tree of Knowledge, endless survival drops every type of plant, so try that, if you've unlocked it yet. I've had excellent success using corn cob cannons, they can really do serious damage on hard survival levels, and they have a plus of being aim-able to any row or column. make sure you get at least 2, 3 being ideal to allow reload time. I'll be trying some of your ideas, fellow zombie-philes, and post how many flags I've completed, as I've only unlocked endless survival the other day, Finally! To the player who goes back to the beginning each time, I suggest you buy the game, PopCap runs specials every now and then, I got mine for half price, but had to buy the backup disk too, which together wasn't a huge savings, but will allow me to play on any computer, or share the game with my family members. How much gold can you save up to? Right now, I have like around 400,000 gold. I was wondering when will it stop going up. Does anyone know? Thank you! playing certain games that require you to use certain plants you have a better chance of getting those plants for your zen garden, i got the grave buster on the whack a mole game, i also got the jalepeno on then bobsled bonanza game. Could Anyone tell me about the thing where you play as the Zombies? I dont have the full version yet Emphasis YET. Can anyone please help me? I'm having a hard time getting aquatic plants, which levels will get me a higher chance of aquatic plants? Is there things I have to do to get them? I've already finished the game, got all the trophies in just a few weeks, yet no aquatic plants. ;-; I'd appreciate the help! I'll agree the strategy works for endless.. but 1000+ seems kind of absurd, even with the pictures. I'm on 78 right now and I can't keep max sun while using one-timers for giga's. Everything else falls prey to the strat(one addition, an extra puffer on the inside grass lane) Just seems like eventually the sun is going to run out or they'll just bust through. Also, you have melon pults in the water where I have double daisies.. and still no max sun. So I completed adventure mode and I didn't get Zen Garden or anything. Did I do something wrong??????? Jay I really need help!!!!! So I went through adventure mode once and I didn't get any minigames or zen garden. Did I do anything wrong????? ?what do I do to get them?!?!?!?!?! I got quickplay but nothing else. Helphelphelp!!!!!!!!! you know how to earn more money in zen garden ? got it from the tree of wisdom . I found comments on everything except what's bogging me--I can't get past hammering the zombies. Granted I'm playing on a netbook with a touchpad, but I can't get past the FINAL PUSH!! Is there a trick I'm missing? actually, icant be bothered with going to level 40 to kill the yeti zombie. This is a solid game, for sure. Be careful about the hype though, this is a quick play as they go. can you play free play on this game? ive beaten the regular play mode twice and i just wanna know if ill ever unlock free play mode..or if it even exsists. I have gotten to a level 34 endless vase breaker and 9 zombie endless. I hear about a second shop somewhere?? Haven't seen that. Hi :) I love Plants vs Zombies, it's the greatest game of all time. The only problem is that when I close the game, my money is back to $0 and my mini game option is gone. Before my game didn't save, but eventually it did. I have the full version, and I hibernate my laptop, but does anyone know how to fix this problem? I know the ultimate strategy for survival endless!!! still have zombotany2 and pogo party to do though, help plz! The levels don't get hard? You *have* played through the entire game right? Perhaps the game start out isn't so bad, but once you pass everything and unlock "I, Zombie Endless" or "Endless Survival" it tends to get a bit more challenging.. Throwing giant zombie wielding tanks at you. Everyone says that you can give chocolate to your zen garden plants, I tried many times but it doesn't work. Why? Where can I get a Microsoft Word version of the Suburban Almanac? With pictures. Google FAILED. here's my strategy for survival endless. you can replace umbrella leaf with double sunflowers when catapult zombies (basketball) are not there. and make sure you use the doom-shroom as soon as you see the red eye gargantuar. I have found the perfect build that will go past 1000 flags, no typo, ONE THOUSAND. I am at 5-7 second time through. I bought roof cleaners but they never show up. Any ideas? Okay, I have played Level 5-7 for a month now, and have officially quit playing the game because I CANNOT get past that level. I do all right for awhile, then eventually the zombies eat my sunflowers faster than I can replenish them, and then I can't plant any more defenses. Is there ANY way to defeat this level? 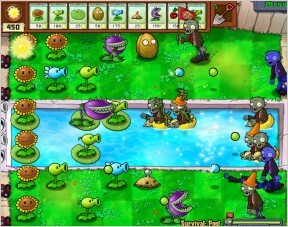 First of all, if zombies have reached your back ranks, don't try to replant your sunflowers right away. Be willing to dig up your sunflowers (they're doomed anyway at that point) and put down some cabbage-pults or cherry bombs to hold back the zombies. If it's *really* hopeless in that lane, give up and let the Roof Cleaner handle it, then replant. 1. Consider buying a rake. It's only $200, but it will buy you valuable time to get more sunflowers up and get your defenses ready. Potato Mines and Squash can serve a similar function. 2. Even though it's a roof level, don't forget about your Peashooters! A snow pea at the top of the incline will slow down the hordes and give you more time to shoot. It's one heck of a force multiplier. 3. Tall-Nuts are worth every drop of sun you paid for them. If you find yourself waiting for it to recharge, bring a Wall-Nut or Pumpkin as well. 4. Put up Tall-Nuts as soon as you need them, even if they're in an awkward place. Even if they're in the middle of your sunflower field, it's better than getting your brains eaten! You can always dig them up and move them later. 5. Use both Cabbage-Pults and Kernel-Pults, if you have room. Cabbage-Pults deal more consistent damage, but Kernel-Pults will slow them down and give *everything* in your line time to shoot. Thanks, Aegeus, for your suggestions. Unfortunately, so far they haven't worked. I always buy a rake, and I like to use the "cheap" plants like Squash and Potato Mines. I used Cabbage-Pults and Kernel-Pults too, and tried using Tall Nuts instead of Wall-Nuts. The last two times, I also used Garlic on the two outer rows, to try to direct the zombies to the middle. None of this worked. I run out of sun and then my sunflowers get eaten, and then Catapult Zombie shows up and destroys what's left. But if everyone else can get past this level, then I guess I can too... someday. Plant 2 sunflowers asap. Then plant potato mine for first zombie. Then continue until 6th sunflower. Plant 2nd potato mine for next zombie. 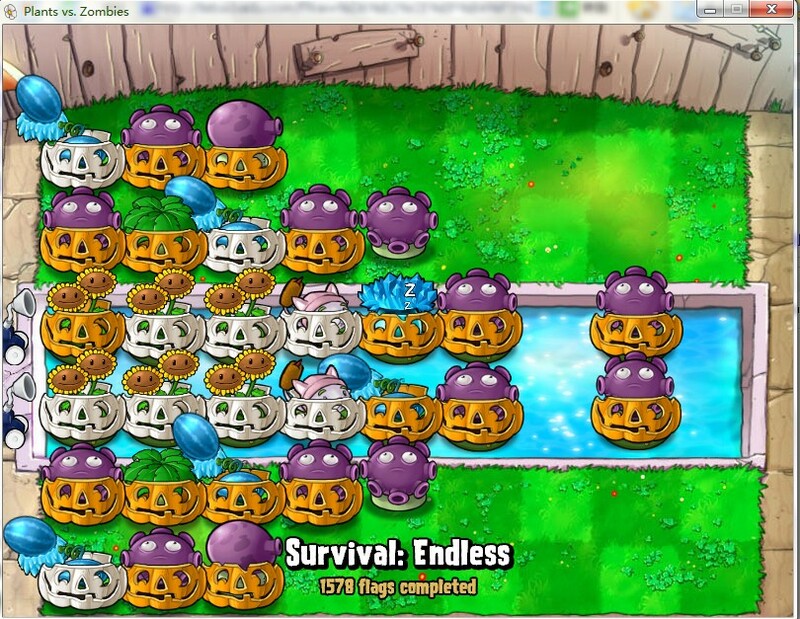 Then when 3rd zombie comes u have 8 sunflowers and enough for a melon pult. PS : DO NOT SLACK when using this method. Works for all daytime levels. This game is a delightful, addcting, stress reliving blast! I've just completed it for the first time, and apparently you need to complete it twice to actually beat it. 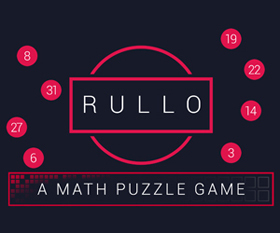 BESIDES the exciting adventure levels, there are puzzles and mini games to unlock. I just cant say enough great things about this game. The music is so fun, the sound effects are a riot, Crazy Dave is a perfect compliment, and the zombies are outrageously funny. You MUST try this!!! how do you get all the plants for your zen garden??? My favorite plant is the melon-pult. I love how it easily takes out a zombie in just a few hits! SwEET! Oh, by the way, the upgrade for the melon pult is the winter melon, which freezes groups o zombies (even zombies on the lanes above and below theirs. try using a series of imps. do not get them too close to each other if there are squashes or potato mines on the lane. What happens if i type "DAISIES" on the game??? hey, i have the game for iphone 4, and i don't know if it affects anything but i can't get the tree of wisdom and some of the games like "you are the zombies" or "survival mode" even after beating the game twice, anyone know how? i already looked in crazy daves shop but the tree isn't there! Just a note to the person who said the game would not save, it is a glitch. Happened to my son too. He was up to level 3-1 and all the sudden it would lose his progress every time he exited the game. Sadly, all we could find to do was start a new profile and that one worked fine. Other than that, I love the game, we still play it, and I am hoping for a sequel. "I'm just a sunflower but see me power an entire infantry"
The best time to let your snail collect coins in your garden is after all the plants are in need of watering. The plants will be dropping coins like crazy after they're been watered and your snail will be raking in a good amount in that next hour.